A 1910 parliamentary election poster for Merthyr in South Wales may seem to have no connection with Stirling, but it is one of the documents on display in the Graham Library in the Stirling Smith Art Gallery and Museum. The aristocrat, Robert Bontine Cunninghame Graham (1852-1936) and the miner James Keir Hardie (1856 – 1915) shared common political ideals when together, they founded the Scottish Labour Party in 1888, with Graham as president and Hardie as secretary. The new party’s manifesto included the establishment of an eight hour working day, the nationalisation of land, mines and other industries, universal suffrage and home rule for Scotland. Graham was the first socialist MP, representing North West Lanarkshire, 1886 -1892. When he was defeated in the 1892 election, which returned Keir Hardie as MP for West Ham, he felt that part of his political mission was complete, as a working man was in parliament representing other working men for the first time. 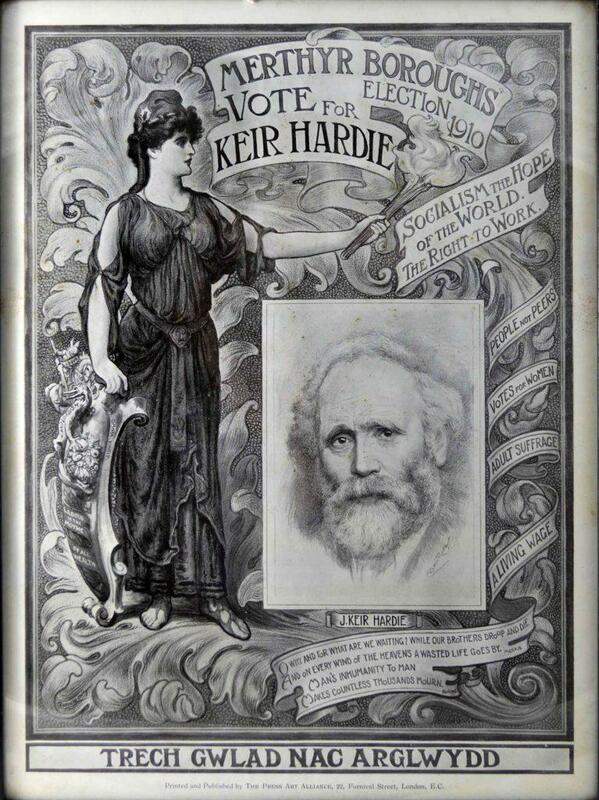 James Keir Hardie represented Methyr Tydfil in parliament from 1900 to 1915, and thereafter, it was a safe Labour seat. The change to the Conservatives in last week’s local election was a seismic shift in a constituency where Hardie’s name and achievements are widely commemorated. The Graham Library is the Stirling Smith is open on Thursdays, thanks to volunteer staffing by the Friends of the Smith.